My first 20 years as a Christian were spent as an Arminian. O.K., I've admitted it. For the most part, I was never really exposed to these doctrines I now consider so precious. Oh, certainly, I met many a Reformed man in my time; in fact, many of them were my instructors and professors at the Bible College I attended in England, but no one ever sat down with me to try to explain the Reformed faith. Practice doesn't make perfect, it makes permanent. 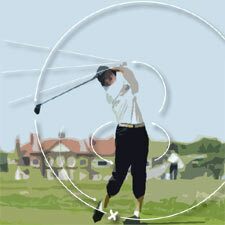 In the game of golf, you can practice your swing and in all reality, if you keep repeating the same mistake (for instance, the way you hold the club), you don't make the swing perfect at all; your poor swing becomes permanent - and only deliberate and intense personal coaching can eliminate the problem. I have been in full time ministry since leaving Bible College in June of 1987, and was fairly confident that my knowledge of the Word was sound. In the year 2,000 I had been a Christian for 20 years. This only compounded my problem - not a golf swing problem (my golfing problems remain unexposed in that I don't play the game at all) - but my many false assumptions and traditions, which were heightened by this simple fact - I had no idea that I held to faulty doctrine. I had assumed I was correct in my interpretation, and went on my way merrily for many a year. As Dr. James White so ably puts it, "those most enslaved to their traditions are those who don't believe they have any." Because the traditions I held to were strong, when I first heard the message of Sovereign Grace and election taught, I have to admit that I resisted it. Well one day in November of the year 2,000 I received a flyer in the mail from Ligonier Ministries informing me that Dr. R. C. Sproul was coming to do a Friday night and Saturday morning teaching in Scottsdale, Arizona. That was only a short distance for me, living in Phoenix. I had never heard Dr. Sproul in person, but had been greatly impacted by seeing his teaching videos on the Holiness of God some years before. Honestly, I thought, â€œhow silly that a man of that caliber would spend his energies articulating an idea so way past its sell by date.â€ I was in two minds as to whether to go or not. I wanted to hear Dr. Sproul, but not on that subject. Any other subject would have been better as far as I was concerned. Well, I finally decided to go, but sat on the back row so I could leave quickly without interrupting folk around me. I stayed for the first session and thought â€“ yes, Dr. Sproul has a point â€“ I canâ€™t fault what he is saying, but I have many scriptures that would refute his conclusions. However, I was intrigued that there was nothing in what I heard that would be easily dismissed. Then the conference included a question and answer session on the subject. This proved to be invaluable for me, because many of the questions I had were raised, and, I had to admit, were answered from Scripture, in their proper Biblical context. I was immediately alarmed by this, as I came to understand that this whole issue required a lot more research than I had previously thought. I left the conference unconvinced, but bothered enormously that I had heard no scripture taken out of context. Being absolutely honest with myself, I had to admit that it was my assumptions about certain texts that were guilty of that exact charge. Knowing that I needed to believe what Scripture taught on the subject, I ordered much material, and began my research. It is never pleasant to examine firmly held traditions, and I felt that this was especially so in my position, when I had taught other things at various times in my ministry. No one wants to admit the possibility that they may in fact have been wrong. I have to say that it took more than a year of researching the issue in depth, before I realized that there was a consistent and clear Biblical doctrine of election and predestination. I also came to see that in order for me to believe what the Bible taught in this area, I had to dispense with my traditional understanding. I was as surprised as anyone to emerge from this self imposed theological study cocoon as a five point Calvinist. Yet that is what happened. And I look back and see the whole thing â€“ the desire to study this and examine firmly held beliefs (I have found many do not wish to do this), and the ability to see the truth - as a work of Godâ€™s grace in my life. How gracious it is that God opened up my eyes to see these things. Although now embracing God's Sovereignty in election, I continued on with my study, and yet waited another year before preaching on the subject at the Church. There's no doubt this issue is controversial. I think many pastors and teachers who believe it, do not preach about it for this very reason. The question then becomes, who are we trying to please - God or men? Jesus preached it and watched many in the crowd walk away when He pressed the claims of Divine Sovereignty in election. In John 6:65, 66 we read, "And He was saying, "For this reason I have said to you, that no one can come to Me unless it has been granted him from the Father." As a result of this many of His disciples withdrew and were not walking with Him anymore." It is extremely humbling to think that God alone gets the credit for our salvation. This doctrine destroys all human pride once and for all, and elevates the graciousness of God in saving a people for Himself, for His own glory alone. Not everyone wants to hear this. Yet I am convinced, as C. H. Spurgeon said, "Christ's sheep will not be offended by Christ's voice." Of course, this subject is not all that I teach, but in that it is something spoken about regularly in Scripture, if I am a Bible teacher, I have to teach something about the subject. I have no right to cut it out of the Bible or out of my teaching, if, as a pastor, I am called to teach the contents of the Bible, which of course, I am. I also realise that even now, there may be areas in my thinking that are incorrect. That is true for all of us, which is why it is so important that we constantly expose our traditions to the light of Scripture, so that we may fully conform with His Word. Rather than sending a golfing coach to help me with my undiscerned problems, God sent a Bible teaching coach named Dr. R. C. Sproul, who was the first (of many) to expose my errors and inconsistencies, and help me see the biblical reality of wonderful, amazing, Sovereign grace. May I ask you, dear reader: Are you open to allow your traditions to be tested? You should be, because it should always be remembered, practice doesn't make perfect, it makes permanent. Isn't God's patience with us amazing? I was saved 20 years ago in January. However, I never even looked at the Doctrines of Grace until I had been a believer for over 19 years. However, once those layers of disbelief were peeled away by the Holy Spirit working in my heart as I studied the scriptures along with the works of Spurgeon, Sproul and Packer, I grasped all 5 points of Calvinism in a very short period of time. I refused to believe at first. However, I found www.Monergism.com and read everything I could find on Calvinism, Arminianism (I had never known it had it name), monergism, and synergism (I had never heard of it either). I believe God orchestrated the whole thing. I remember the day I surrendered to the truth very well. God suddenly became very huge. The reality of His sovereignty overwhelmed me. I believe that those who are Reformed should be very humble because of all people they should grasp the enormous miracle of our salvation. I was a believer for over 10 years in a PCUSA church before I ever heard anything about the reformed beliefs. I had no idea that there was much of a difference between the Presbyterian denominations. There was absolutely no teaching or preaching done about the reformed views in the PCUSA church I attended. It was non-doctrinal and Arminian. But by Gods sovereign will, a few things happened to me. First I started to actually read my Bible, (which few did at that church.) Second, a new member started to teach Sunday school classes using Ligonier tapes. He was reformed and he started to disciple me in the reformed doctrines. Finally third, I became a deacon and was introduced to the PCUSA Confession of Faith book. This contained all the creeds and confessions of the reformed tradition in it. The leadership training covering this book though was very light. We just skimmed over the prefaces. So in reality, the PCUSA doesnâ€™t view the historic reformed orthodox confessions with any kind of authority. But after reading the Westminster Confession of Faith, I really started to get a clearer picture of Godâ€™s Sovereignty and His Sovereign Grace. I started to embrace the five points of Calvinism, Biblical and Systematic Theology, Covenant Theology and a reformed view of Spiritual Gifts. During this time, I found monergism.com and the-highway.com which were tremendous helps. I tried though to remain in the PCUSA, in which my family and I had built up friendships and in which I still held my deaconship. But the more reformed and conservative I got, the more I made everyone else around me uncomfortable. Pretty soon I found myself alienated and very unhappy with the worship service including the preaching. After much deliberation and praying, I made the decision to move to a close by PCA church. After only being in the PCA church for a short time, my families faith had grown tremendously and my knowledge of the reformed faith had been polished and strengthened. Being in a much more conservative church also helped us to have a more peaceful and stable faith, without the emotional ups and downs. So I thank God everyday that He brought us into the reformed faith. I sat in my church Sunday (Church of Christ) and suffered thru a sermon about falling from grace, ie losing your salvation. The preacher stressed that Gods pencil does have an eraser. I have been reformed for about 2 years, by Gods grace my eyes were opened but I continue to attened the Church of Christ because my Wife does not see what I see, I just keep praying that God will open her eyes (I have no doubt as to her salvation) to the doctrines of grace. Maybe I'm wrong but I just bite the bullet so to speak rather than to divide our house -not to mention the kids- I get most of my nourishment from sites like this one as well as Dr Sproul's broadcast. As I sit there Sunday listening to how dangerously close we all are to losing our salvation at any given time and I heard all the "Amens" from the congregation I ask myself, "don't these poeple see that if this is true then they have absolutly no possibility of ever entering heaven." To think that I would have to depend on my own efforts to stay saved would scare me to death!! Why don't people see this? I'm with you Don. I started turning to the dark side :-) several years ago, whereas my wife and teenage daughters are still Arminians. I too sit week after week in an Arminian church -- "seeker friendly" & mega -- often cringing at what is said from the pulpit, uh, that is, stage. And I too don't want to divide our household over this, or at least I don't know a good strategy for getting them to the reformed side other than praying that they would see the truth. And after all, I remember a believer many years ago telling me about the doctrines of grace and I remember thinking she was nuts -- God can't be a meanie like that. One interesting thing my wife said a while back is that if God is the one who chooses, she is afraid He wouldn't choose her. I am reformed, but my wife isn't. However, I have made it something I diligently pray for every day. She has softened to it quite a bit lately. In fact, she has agreed to go with me to vist a Reformed Baptist church in a couple of weeks (after our daughter's wedding this weekend). Hang in there. Pray for your pastor to "get it" at well. The Holy Spirit is the one who must change those hearts. We sure can't do it. My own increasing understanding of the Reformed faith came out of a Charismatic church background. It wasn't particularly 'wild', but was inconsistent over sola scriptura etc. as you'd expect. I can only encourage you as heads of your homes to read Scripture with your wife and kids. Just a short explanation of the passages you read allows you to 'drip-feed' sound teaching into your family. It is quite possible to teach a Reformed worldview/theology without using all the usual jargon. Can I recommend writers like John Piper/RC Sproul to stir the emotion and zeal while bringing a Reformed perspective. Today is a hard day to lead a family spiritually. It is far better to be positively drawing them to greater truth, than for them to be dragging you reluctantly to church. I have seen many 'good Reformed men' lose it at home because their family see their religion as being negative, complaining and oppositional or cynical. The doctrines of grace should be the most winsome of teachings - a cause for deep joy! May God bless you as you convey that joy to your families. Dear friends. Is really amazing to see how many people are out there who feel the same like me. I found very familiar the feeling of Dave when he said: "Pretty soon I found myself alienated and very unhappy with the worship service including the preaching". The truth is that my previous church is turning very cold in their service and love between members. The deacons (just to mention one example) are very jealous of each other, being critical of each other behavior or lack of "work in the church". I felt very uncomfortable with it (being myself a deacon) and i'm sure the cause of all this kind of troubles is the lack of biblical and sound preaching, based in the doctrines of grace. When we see the oportunity to work for our God, no matter in what way (painting the building or teaching at sunday school) as a gift from God's grace (as every other thing we have), how can we focus on what the others do or cease doing? But the content of the preaching in that church is very moralistic: "you are more spiritual or mature if you work more in the church, otherwise you are only religious people" is the way to resume the content of the preaching. I decided to move with my wife to another church, where the preaching is based on the doctrines of grace, and has a real and serious emphasis in sanctification for the believer and repentance for the non-beliviever. How much I needed to hear that kind of teaching, I've been encouraged to leave many known sins (a real strugle in my life :) ), to change my character and received more encouragement to rely on God's grace in spite of my failures. I love the reformed doctrines of the Bible! P.S. One of the known sins is being proud of "being reformed". One thing I battle is the natural tendency of my heart to think of me as more mature as the ones who doesn't understand this doctrines. Please, brothers, one thing we all can do for advancing a reformation in our churches and families is to pray for humility in this matters. God bless you all. But, since I'd developed a tremendous respect for him and the accuracy of his work, I gave his lectures on predestination a shot. Now I'm pretty much Reformed! I attend a PCUSA church currently where the pastor is quite Reformed and so are many of the people. However, I sense a tendency to conceal that aspect and keep it in Sunday school. I think many there are too caught up in pre-packaged seeker-type stuff, and lately the worship has had some elements that really seem to have gone too far. I've also attended a local OPC church a few times, and I find their services to reach me on a far, far deeper level. I always feel satisfied when I leave there...sometimes I'm still hungry when I leave the other! I'm kind of floating between the two right now. It's comforting to know that God is in control, and that I will end up where he wants me! Thank you to Hans, Ali and Mike for the encouragement. I will keep praying that My wife will come around. God bless you all.